The sad reality of the Obama presidency. 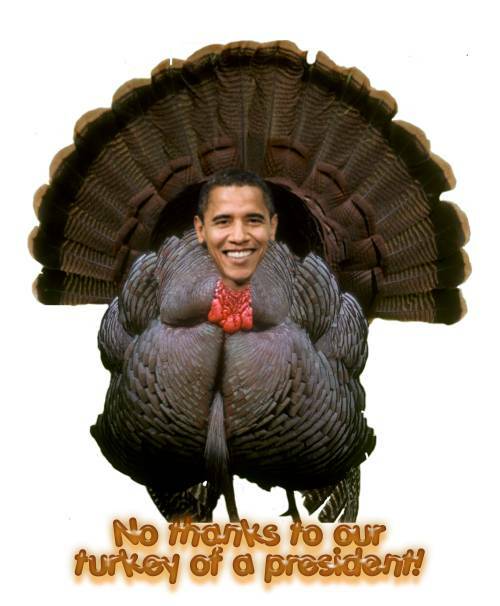 [+5] - parados - 11/21/2012So, are you standing on principle Spurt and refusing to buy from any grocery store that accepts food stamps? [+3] - Setanta - 11/21/2012It's disgusting the way they feed at the public troth . . . but you're right, it's not their fault, Obama made 'em do it . . . after all, they can't take responsibility for themselves! In what way is it sad that the poor can have a good meal thank to the government help or that the GOP had harm the economic to the point that such help is still needed after they almost drove us into a second great depression four years ago? At least we are working ourselves out of the hole the GOP had placed us in faster then we did after they cause the 1928 great depression by allowing the financial markets to run wild as they did in the early 2000's also. Of course we had yet to know if the GOP is going to force the nation over the financial cliff in order to protect the super riches tax breaks. Thank gawd that the waterdude family can eat this Thanksgiving. 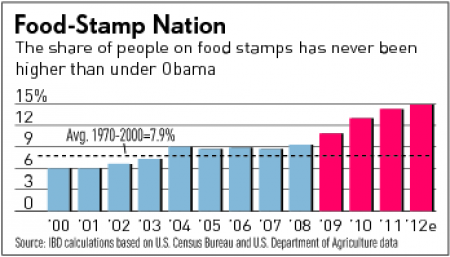 What is sad is that as of June 2012, a record 46.7 million Americans are using food stamps. What exacerbates this miserable situation is that Obama wants to expand Americans dependency on government. Obama is spreading the misery around. So, are you standing on principle Spurt and refusing to buy from any grocery store that accepts food stamps? Increased use of food stamps is a clear sign of how much the economy was screwed up. Now if you could be realistic about why the economy got so screwed up then we could have an actual conversation. When you insist that the economy wasn't screwed up until after the recession was over then you don't seem to want to live in reality. Keep on whistling into the wind, H2O. Your views are still unAmerican. Most of the country knows how to assess the reality of the situation. 68% still lay blame for the recession on the failed Bush presidency. If the country drives over the fiscal cliff, polls say Republicans are going to get the blame by 2 to 1. Your propaganda isn't convincing anybody. Of course when you rigged the system so 500 hundreds or so individuals had more of the nation total wealth then the bottom fifty percents of the population you are going to have more people needing government aid to survive. Why are you not happy as that had been the goal of the GOP to destroy the middle class and only have the very very rich and the very very poor. MJ, you're not thinking clearly. The goal of Obama is to DESTROY the American way of life. Obama's propaganda resonates with the dumbmasses. Let's get rid of farm subsidies while we're at it! If you mean billionaire white men rule you are right and you do have the GOP view of the 99 percents of the population down correctly. Amusing that this view cover most of the people who voted for them as it is the red states not the blue states that take the most help from the government. Nobody in Yerp or in a country with the potential to join the EU would welcome Mr. Soggy. We got shot of the fascists in 1945, we don't want to invite them back. They would fear for the chastity of their livestock. Someone has to grow the food, though.